Brushless DC motors have several advantages over their brushed counterparts: They have longer lifespans, run quieter, and have built-in position control thanks to the hall-effect sensor that tells the controller which coil to activate. In operation, brushless motors behave similarly to stepper motors, with the rotor being pulled into discrete positions with electromagnetism. 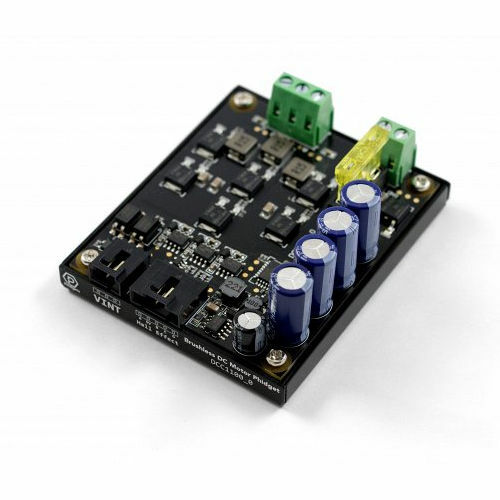 The DCC1100 requires a 8-30V DC external power supply and can control a single brushless DC motor from a port on your VINT Hub (see the Compatible Products tab for a list of hubs). In software you can either control the motor velocity, acceleration and stall velocity directly, or you can use the PositionController object to set the motor position using our closed-loop PID controller. For more information on how to use and configure the PositionController, take a look at the technical section of the DCC1100 User Guide.